What is Worthy Book? 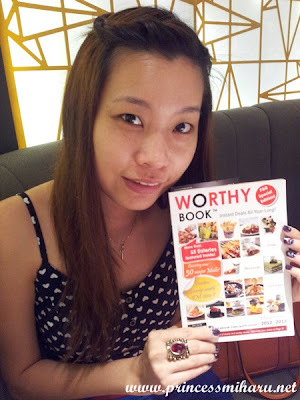 Precisely, the Worthy BookTM F&B Special Edition 2012-2013, is a book that will excites every food lovers!! You ask me how? Okay, let me tell you! Secondly, it can eases your food hunting trip because it covers over 30 major malls, which included Pavilion, Mid Valley Megamall, Times Square, One Utama, Sunway Pyramid, etc; and also malls that are near to your neighborhood, such as Festival City, 1 Mont Kiara, Ampang Point, Publika, and many many more. No more hassle deciding which malls to go, just visit your favorite mall!! I don't know about others, but for me, I kinda love to find out the story behind a eatery. It is somehow fun to know the concept, the mission, and the motive of a restaurant/eatery. If you are a bit busybody curious just like me, Worthy Book definitely fill up your curiosity. Every eateries came with the biography and story behind the foundation. In addition, details such as cuisine type, operation hours, price range, outlet address, website, contact number, and email are all provided for our convenience. Every eateries will comes with the "Must Try" items that are recommended and usually the signature dishes of the restaurant/eatery. At the bottom of every eateries, the crew member of Worthy Book will stated their reviews and opinions regarding the particular eatery. Worthy Book comes with voucher savings worth RM'000s!!! ^_^ OMG! 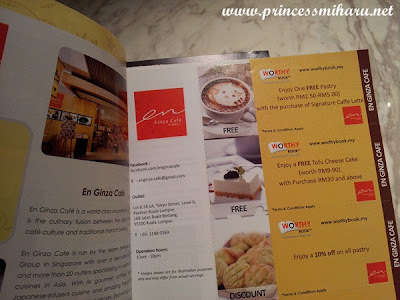 You can try out every single eateries yet taking care of your wallet!!! How cool is that?! Just tear out the voucher upon your ordering. 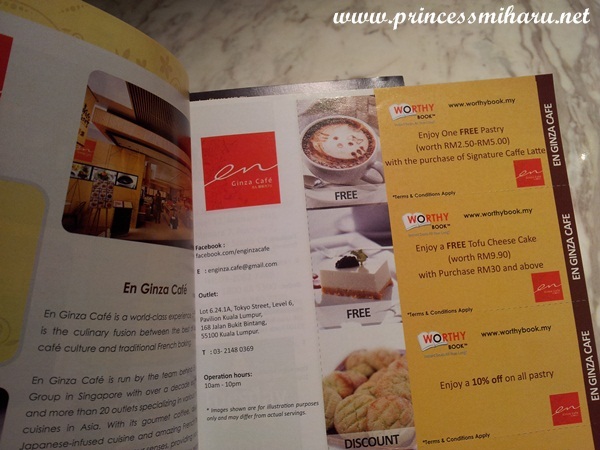 Every eateries offered different kinds of promotions and saving plans for us, the food lovers!! I visited En Ginza Cafe, located at Tokyo Street, Pavilion. This is the Macha Green Latte and Jasmine Green tea in pot, which is a Buy 1 Get 1 free promotion!!! Hehe... Seriously worthy!! And guess what? 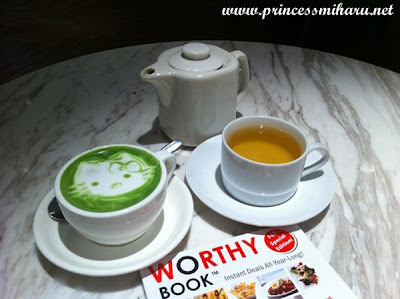 You can buy the Worthy Book at all major bookstores, such as MPH, Popular, Times, Borders, Kinokuniya; and selected myNEWS.com outlets in Klang Valley, with the price of RM29.90 only!!! Feel free to visit Worthy Book website : http://www.worthybook.my/ or Facebook: http://www.facebook.com/worthybook for more information and promotion!